Requested by Arrow-1 and produced by me, the amazingly new but old 8-way movement script! The part that makes it new is that this one is for VX!!! This script supports 8-directional movement along with diagonally oriented sprites so you can actually see them walking diagonally, it doesn't look like some weird line-dancing half diagonal strafe thing! YAY! Please be advised that this script has only included methods for the hero/party to move diagonally and eventas are at this time unsupported. I can update it, but that would take more time and there might be an update later on if people need it. # automagically enable 8-way directional movement for your hero. # Corrects direction so events will respond when hero is facing diagonal. 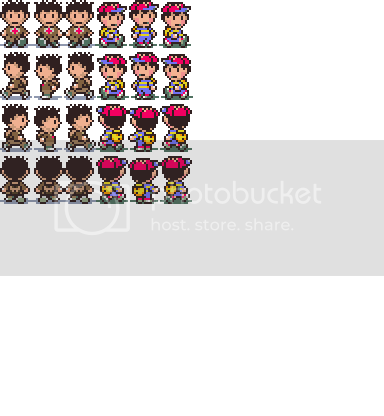 # Adds functionality for diagonal character sprites. Also need to create a custom sprite sheet for your heroes and import it into the Characters section/folder. It should look something like what I have sampled below. Oh yeah, almost forgot. To use this script, be sure the character sprite sheet is named as <character name>.png or whatever.